Police personnel were given First Aid & BLS training for 38th & 39th batch at Fortis Escorts Hospital under Saksham / First Responder's Program on 3rd and 24th October respectively. A total of 37 Sub inspectors from Intelligence Academy 48 Sub-Inspectors from rajasthan police Academy were trained in these 2 sessions that were organized in association with Rajasthan Police Academy. 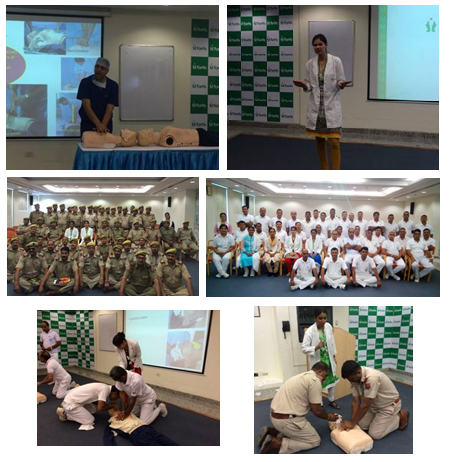 The First Aid training was provided by Clinical Instructors Ms. Deepika Mann, Clinical Instructor. It focused on chain of survival, meaning of first aid, contents of first aid and its aims. Details were elaborated on scene survey, assessment sequence components, control methods of bleeding, tourniquet applications, pressure & ice, shock, burns and its degree, first aid for burns, electric shock, fractures, wound dressing & bandages, amputation, airway obstructions, choking, Heimlich maneuver, epitasis, heat stroke, poisoning, heart attack & brain attack, bites & stings, drowning, road safety etc. The Basic Life Support trainings were provided by Dr. Akhil Agarwal, Sr. Consultant, Anesthesia and Ms. Deepika Mann, Clinical Instructor. The sessions focused on concept of Basic Life Support, its importance, techniques and important steps while providing BLS during emergencies. The crucial role of participants in rightly recognizing the emergency and timely providing BLS to needy was specially emphasized. Hands-on training was provided by Clinical Instructors Ms. Deepika Mann and Ms. Jaya Ragini to practice and enhance their learning on techniques of Basic Life Support. At the end the participants resolved their queries and recapped their learning which was followed by handing over the certificates.